The 20-year-old from Kettering was not named on British Athletics' funding programme for 2014-15 last autumn. She achieved the 100m hurdles qualifying time for Rio this summer but then struggled with injuries. 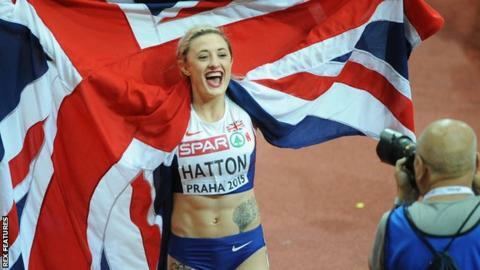 "As an athlete it's really hard to break through and gain funding," she told BBC Radio Northampton. "This season I've turned to crowdfunding and asked if anyone out there can support me as little or as much as possible on my road to Rio. "I've already reached my £1,000 target within two days through the power of social media. I will need more to go to Rio, but I thought if I put out a target and that gets reached that would be amazing, and now it's been exceeded, which I'm absolutely over the moon about." Hatton, who gives incentives for those who donate ranging from personal emails thanking them to a meet-and-greet, previously put herself "up for sale" on eBay in 2013. This year Hatton set a new British Under-23 60m hurdles record of 7.90 seconds, which also took her to third on the UK senior all-time list. But after a foot injury scuppered her World Championship hopes, the University of Leicester student said she would need to carefully consider whether she would accept British Athletics funding this year. "You have to hit very specific times and guidelines to get onto funding. For my last season I wasn't put on funding - there were various reasons and actually I think it was a really good thing for me," she said. "It's something I can't be secure on. I had a fantastic indoor season, became European indoor silver medallist, which was completely unexpected by lots of people, but me and my coach worked really hard. "I have already got a qualifying time for the Olympics, but then I picked up a foot injury, which meant that I didn't have as strong a season as I would have liked. That means I can't be certain I'll be put on to funding, and also I've never been on the world-class programme before. "Coming into an Olympic year, I can imagine there are a lot of responsibilities on that programme, and with such a massive change I don't know if that would be the right thing for me."